"An exceptional and inspiring book!" The Columbia Review. This book’s intriguing title is an ingenious pun intended. The second visible hint that this is an extraordinary book is served by its brilliant cover: The letters of the title are arranged to resemble a vision test in a doctor’s office, set against a background that appears to be a distorted vision of the side of the building. Part memoir, part inspirational, and part business wisdom, “How I Gained My Vision By Losing It” by Charles Lee Sidi makes for a rare balancing act of honesty, humility and humor, certain to bring readers to tears and laughter, sometimes simultaneously. Furthermore, this truly is a suspenseful story, an unusual quality for books of this nature, primarily because of its unique structure as two stories that move on parallel lines until both threads reach a climactic conclusion that’s both heartwarming and wise. (The unusual structure and its storytelling success should not surprise us as we learn about the author’s professional skills and talents in the fields of design and construction). The story begins in California with a health crisis that threatens to deprive the author of what remains of the vision in his eyes. Under a cloud of impending tragedy, Charles and his wife, Sarah, get in the car, and she drives through the night across the Mojave Desert from California to Arizona. That journey, and the medical drama that follows, serves as the second rail to the main story–Charles’s life. Growing up in Manchester, England, Charles was clearly a precocious boy with a good measure of hearty curiosity and a bit of naughtiness. The family backgrounds provides a wonderful picture of what it was like in England in those last few decades of the 20th century for a Jewish immigrant family with a mix of economic challenges, cultural struggles, and tightknit familial bonds. An English boarding school, as well as boundless intellectual and artistic energy, form a launching pad for a unique career that combines design and construction, earning Charles a number of national awards and honors. Then, driven by an insatiable entrepreneurial sprit (“Go west young man…), the author relocates his family across the Atlantic and the continent all the way to Arizona. Launching a custom homebuilding company shorty before the Great Recession makes for a host of new trials and tribulations, followed by a dramatic pivot to an inventive new product and the challenges of an ambitious startup, which further test the author’s resilience, determination and, yes, his vision. At its essence, this book excels because it is candid to a fault. The author’s uncanny ability to tell captivating stories is rooted in his rich perception of the details of life and the inimitably varied traits of each person, which make humanity so diverse and interesting. And like any good book, “How I Gained My Vision By Losing It” is at its essence a love story, with Sarah as the unsung hero (or perhaps the deservedly sung hero), as well as the author’s passionate love for life itself. 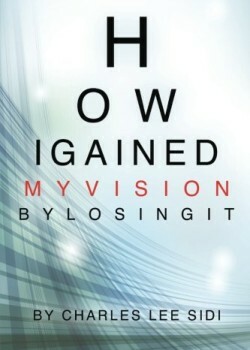 While “How I Gained My Vision By Losing It” delivers on the promise to tell us how the author lost and gained his vision, both physically and spiritually, there is no doubt that this book will help every reader, no matter their backgrounds, circumstances, or character, to regain, or at least refocus, their own personal vision. Highly recommended!